Today's post [ TREND + PRINT REPORT ], is from FV print and fashion contributor AARYN WEST of Aaryn West Studio based in Los Angeles, California. Go here, to check out their website. 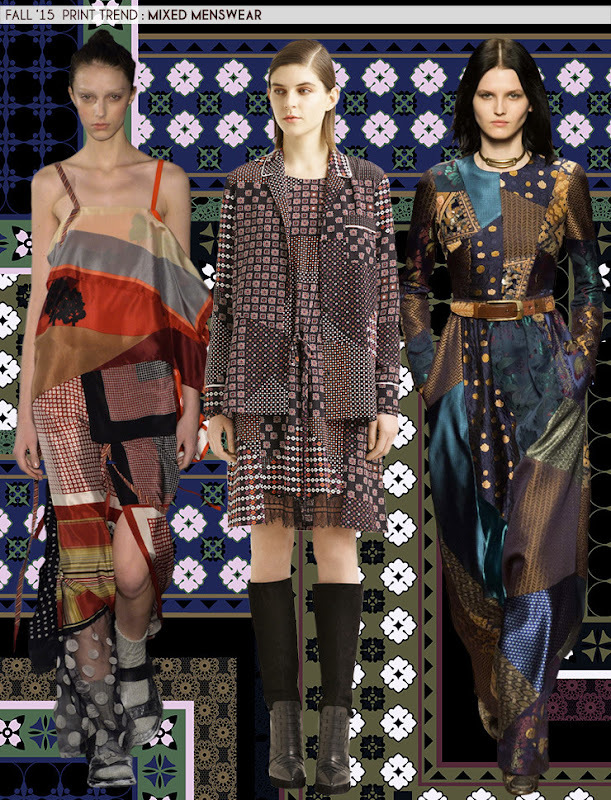 Below are their some of her Fall 2015 Runway Trend inspirations: Mixed Media, Geometric Stripes and Nouveau Floral along with their print backgrounds. 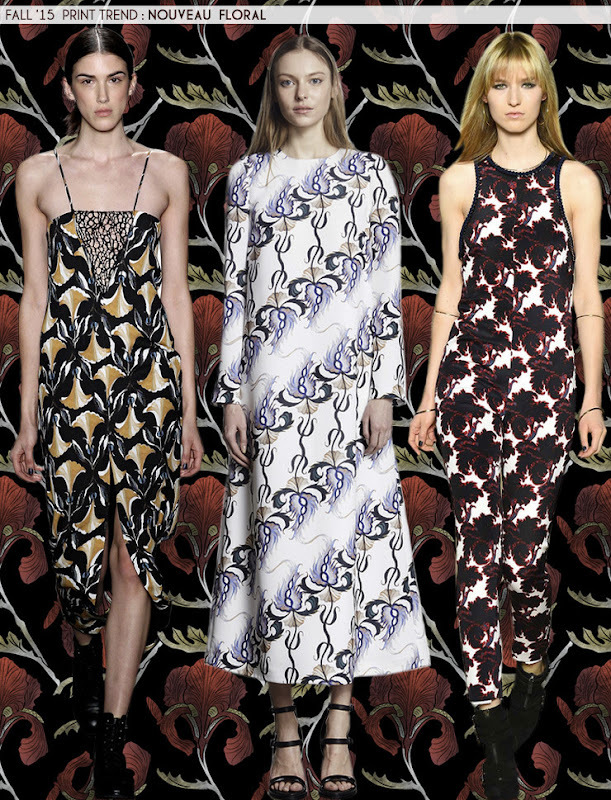 There seems to be something invariably more masculine about Fall prints than in the Springtime. This patchwork mash-up of traditional menswear motifs is the perfect example of that notion. Staying within a limited color palette and keeping your print elements small will allow for maximum harmony in this mixed print trend. Clean geometric shapes are carefully arranged and layered in these densely packed stripes for Fall 2015. While it may sound a little generic at first, we find it to be quite a versatile trend. 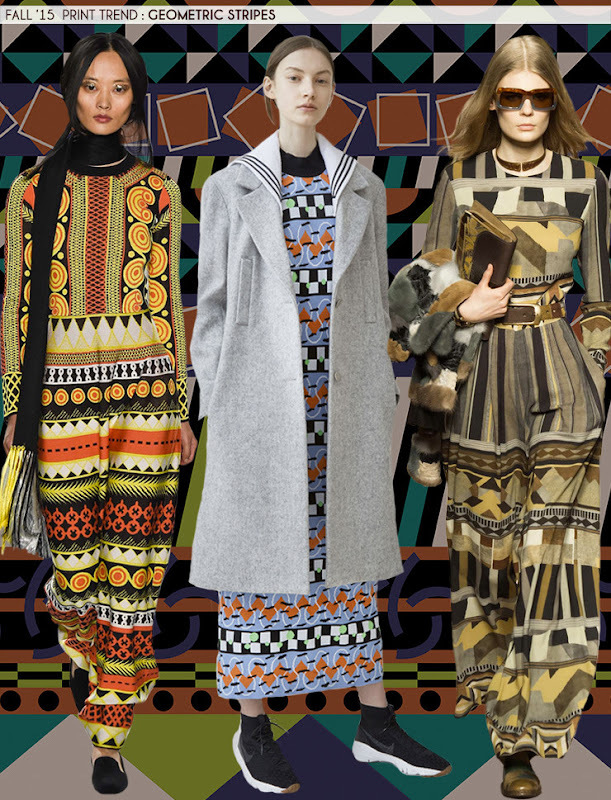 Throw a few Moroccan or African elements in for a tribal feel, or take a more optical approach for a Memphis vibe. You could even have it merchandise with your 70’s group by adding in a simple and clean daisy shape to one of rows in your stripe. Take a more simplified approach to your Fall floral designs, as seen here with these stylized Art Nouveau inspired motifs. One delicately detailed flower is repeated throughout the design in a simple, yet compact, layout, which keeps the eyes moving but doesn’t overwhelm the viewer. We actually see it as a subset of a larger Fall 2015 trend rooted in Interior Design, which we’ll explore further a little later on in our review of Fall collections.